As the old jingle goes, double your pleasure, double your fun, and this year we have not one, but two Stadium Series games on the docket. 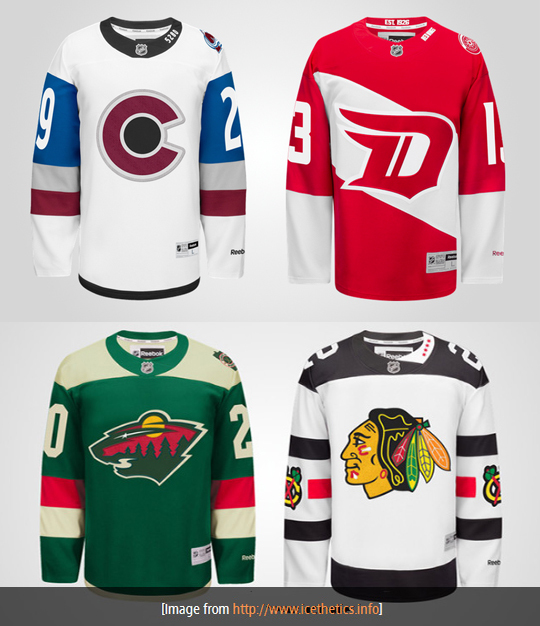 First up, the Wild host their long awaited outdoor contest when they take on the Blackhawks at the University of Minnesota’s TCF Bank Stadium on February 21st, and second, the Red Wings head to Colorado as the Avs play host at Coors Field just one week later. We’ve already seen the jerseys, and frankly, they’re not as bad as they could have been (see last year), but now it’s time to take a look at the goaltenders’ masks to go along with them. Here’s what we’ve seen so far. 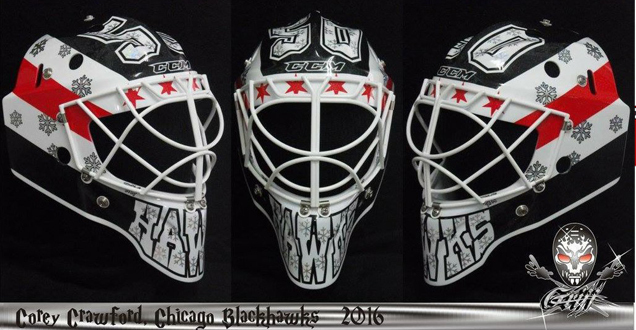 For Crawford’s third go around at an outdoor game, one could suspect that the Blackhawks’ netminder would be running low on ideas for new masks, but his most recent creation with Griffe Originale artist, Stephane Bergeron certainly didn’t disappoint. Crawford admitted to having quite a bit of input to the final design, having sent Bergeron a sketch of his own after seeing the artist’s first concept. 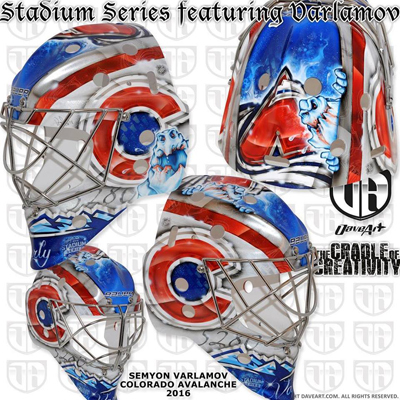 “When I sent him my first mock up, he didn’t like it,” Bergeron told NHL.com, “but a few days later he sent me his own rough drawing.” In addition to his goaltending accolades, it seems Crawford’s beginning to think like a designer too, adding that he “wanted a little something with a Winter Classic feel, so it’s pretty much a bold design, because it’s kind of hard to see detail from further in the stands.” Good thinking, Corey! 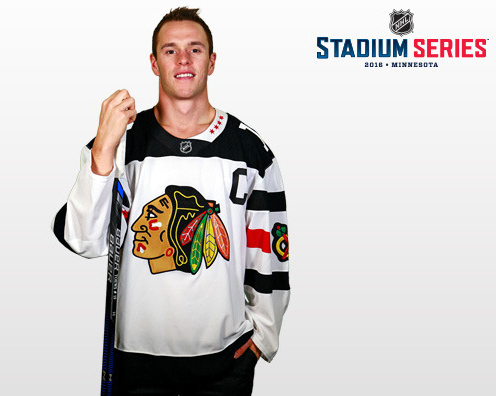 Pulling directly from many of the design elements in the team’s Stadium Series jerseys, Bergeron and Crawford incorporated the city’s four red stars–also on the jersey’s collar–across the front, and the bold red and black striping on each side of the mask. The snowflakes were created using aluminum, cut out with a laser and placed on the mask by hand. Bergeron calls the unique metallic shade “Chameleon Chrome,” neither a silver nor a gold, adding that the stadium lights will give the chromed add-ons an extra pop. 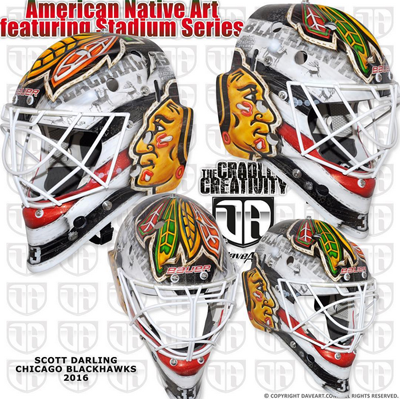 Like his teammate’s, Illinois native Scott Darling’s Stadium Series mask incorporates elements from the event jerseys and sticks to a simple composition. While the overall concept of this mask may be pretty cut and dry, insane detail is never in short supply in artist Dave Gunnarsson’s masks. I actually really like this mask, particularly the detail Gunnarsson threw in the white areas and the stitching around the edge of the feathers on top. I liked the feathers, that is, until my esteemed colleague so graciously brought their toupee-ness to my attention… Thanks, I guess. Trump associations aside, this is a solid mask design. Not my favorite in Darling’s repertoire, but for a one-time event? I’m satisfied. While his colleagues went a more team-oriented route with their Stadium Series mask designs, Wild goaltender Devan Dubnyk took the opportunity to create something more personal. As revealed Friday night on the Wild’s website, Dubnyk attempted to roll everything from his family and childhood nickname to the Wild and Vikings all into one, and frankly, the end result kind of looks that way. The giraffe on the right is a mainstay on Dubnyk’s masks, this time wearing a viking helmet (totally sensible) as a nod to Minnesota’s football club. On the left, Gunnarsson depicted Dubnyk’s two children, Nate and Parker, also wearing viking helmets plus goalie gear. 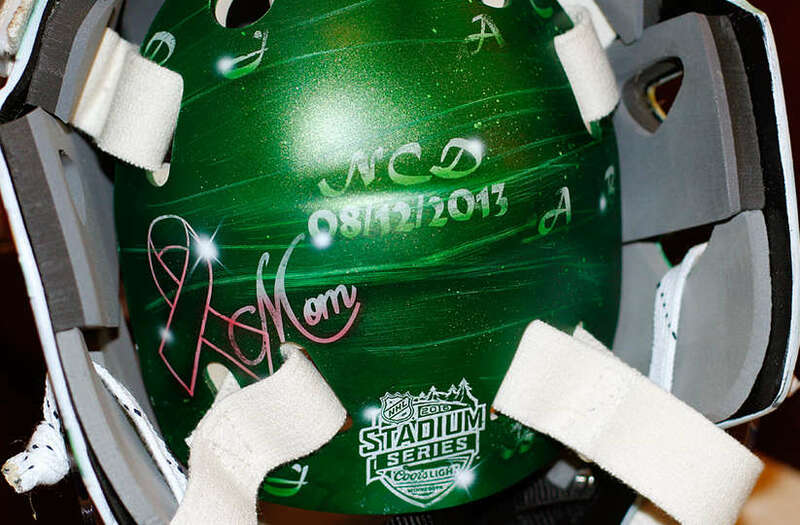 The backplate has further family ties, honoring the netminder’s mother who is a breast cancer survivor. While I appreciate Dubnyk’s effort to honor his family, this design is all over the place. Under the cage has the message “Minnesota Vikings hockey featuring the Dubnyk family” (wowza) which kind of sums it all up. The Minnesota M and tree motifs do make an appearance on the top, but the vikings, the wood, the giraffe… it’s overkill. 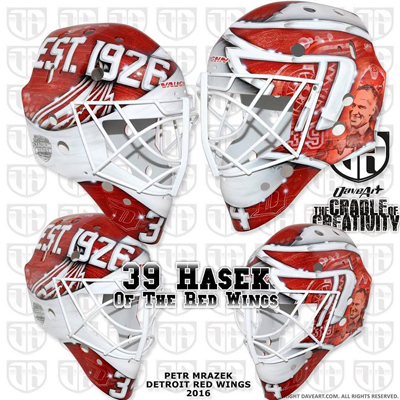 Red Wings veteran Jimmy Howard has a long history of creative mask designs. Designed by his go-to artist Ray Bishop of Detroit’s own Bishop Designs, Howie opted to pay tribute to Tigers’ greats on his mask for the outdoor game at Coors Field in Denver. With red and white pinstripes and illustrations of Ty Cobb and Kirk Gibson, just to name a few, Jimmy has fully embraced the city’s baseball history, even including the dates of the Tigers’ World Series championships across the top. The style mixes old with new, combining the modern “D” logo on top with with the vintage-style portraits and baseball stitching on the sides. The backplate, painted entirely in pinstripes, brings the ballpark theme full circle with a full baseball and Tigers in the center, surrounded by the date and venue of the event. It’s interesting to see Howard go with a vintage aesthetic on his mask when the jerseys are so modern, even with the Stadium Series logo incorporated. Whether or not we’ll even see this mask take the ice is another question all together, given Howie’s less than stellar performance in his 18 appearances this season. Full disclosure: I had a bit of a fan girl moment when I saw this mask for the first time last weekend. It’s just that great. 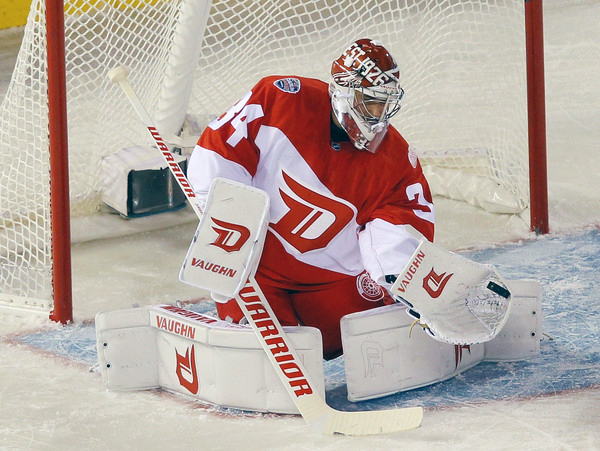 As a tribute to Red Wings legend and Mrazek’s fellow countryman, Dominik Hasek, Gunnarsson created a beautifully graphic yet intricate design that looked pretty damn sharp during the Red Wings’ win over Colorado at Coors Field. While I wasn’t a huge fan of Detroit’s jerseys at first reveal, they actually grew on me throughout the game, partially because of how great they looked with this mask. 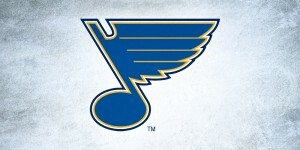 The curve of the blank white portion through the center perfectly mimicked the diagonal striping in the event’s jerseys, which was also tied together through the “Est. 1926” in bold lettering on the right side of the mask, opposite the same writing on the collar of the sweater. 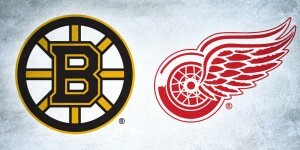 The tail of the D logo cuts through the white in just the right spot, with the letter containing a faded portrait of Hasek along with his number and the primary Red Wings logo. Overall, the composition and balance of subtle and bold are what make this mask such a success. 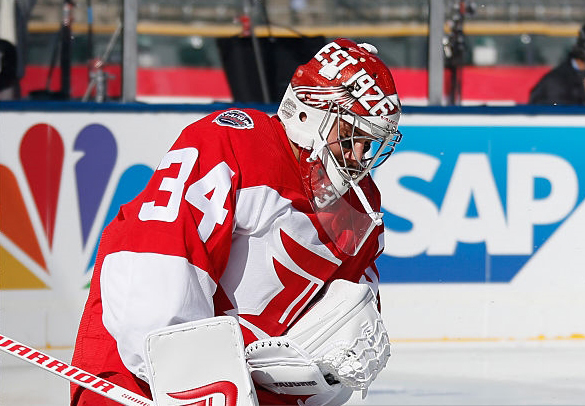 The design took into account the outdoor setting as well as the pairing with the uniform and pads, while also fitting in some personal touches for the goaltender. Bravo! While there are some nice elements to this mask, it’s definitely lacking the main features that made Mrazek’s such a success. Primarily, the consideration of the jerseys. 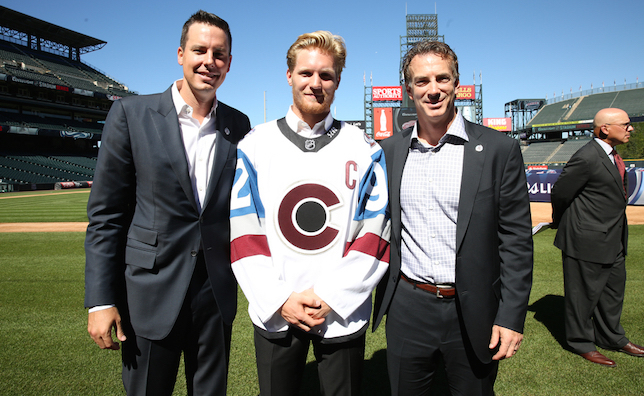 The Avs Stadium Series sweaters had a really nice, sophisticated color palette of maroon and medium blue with clean lines and color blocked sleeves. 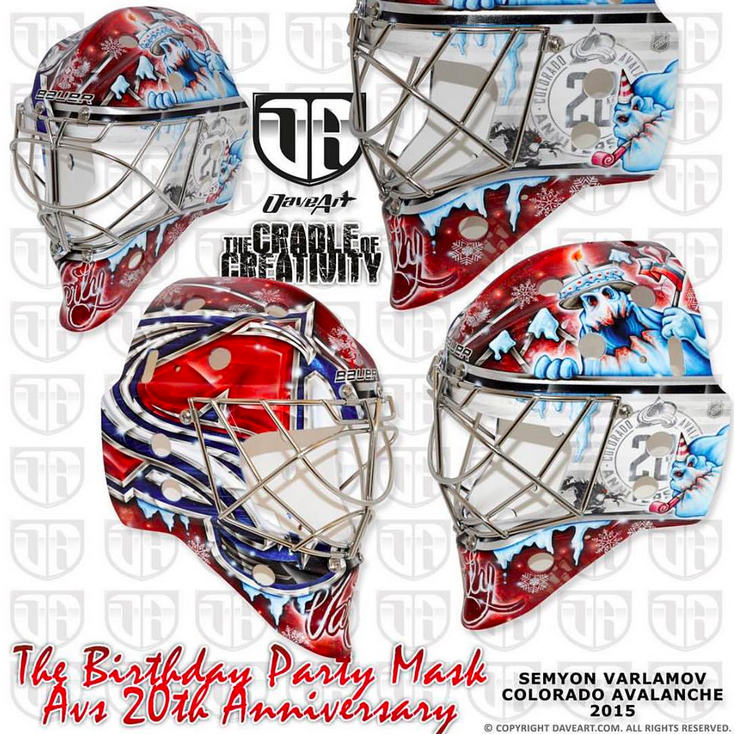 I would’ve liked to see Varly take this opportunity to stray from his usual style and go for a more graphic, retro style design a la Marc-Andre Fleury. The more saturated red and blue here don’t really mesh with the style or colors in the jersey, and it made for an odd contrast when all put together. 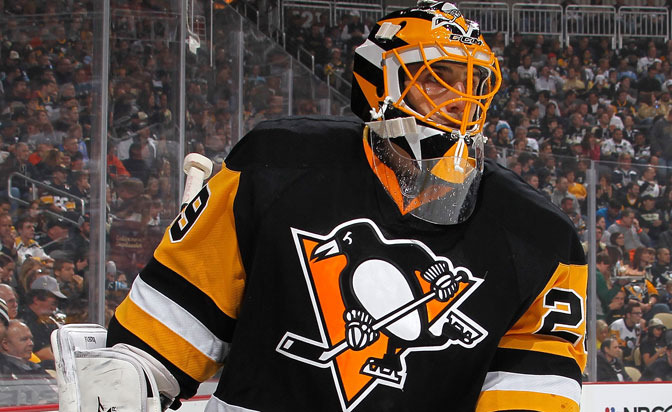 On the plus side, I really like the use of the Stadium Series “C” logo on each side of the mask. It’s a nice, clean alternate mark that I’d like to see the team use more often. 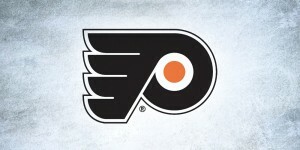 The color and chrome effect however kind of took away from the cleanliness of the logo how it appeared on the sweaters. Agree? Disagree? Tell us in the comments or on Twitter!